“There is a way forward if only the government would listen to NACCHO” read the headline of the editorial in the National newspaper at the end of July this year. This rousing and welcome endorsement of NACCHO and the Aboriginal community control model of health delivery was published towards the end of a huge year for NACCHO and our members as we focused on articulating our vision, delivering good policy, celebrating our successes and raising our profile on both the national and international stage. A little over twelve months ago we resolved to approach the year ahead with a heightened sense of purpose in a bid to ensure the sector was in a pivotal position coming into the Federal election and beyond, regardless of who won office. With new CEO Lisa Briggs at the helm, an engaged and active Board and a very hard working office, NACCHO has certainly had one of the busiest and more successful years in in its 21-year history. There have been so many highlights this year it is hard to know where to start but perhaps the most significant achievement was the launch of NACCHO’s Ten-point Plan, Investing in Healthy Futures for Generational Change 2013 -2030 alongside the Australian Institute of Health and Welfare report card on Aboriginal Community Controlled Health Services. The ten-point plan was, for me, the realisation of 20 years of work in our sector. Throughout my career I have watched various well-intentioned governments drive the Aboriginal health agenda and dictate to our sector their plans for us to follow. Rarely have we had the opportunity to properly spell out our collective approach and provide our own vision at the national level: to drive policy rather than react to it. The ten-point plan, created with the knowledge and experience of the Aboriginal Community Controlled health movement and timely in an ever-changing environment spells out how gains in Aboriginal health can be achieved from our perspective of “Aboriginal Health in Aboriginal Hands”. It provides our sector, stakeholders, partners and governments with a clear set of priorities and strategies that will result in improvements in Aboriginal health outcomes. It is underpinned by the goals and sentiments of the Close the Gap Statement of Intent signed in 2005, so it has at its core shared vision for a better future for our people. It was officially launched at a Parliamentary Breakfast in Canberra in June, which was attended by a range of Aboriginal leaders, elders and senior government Ministers and officials. At the event we also launched research we had commissioned from the Australian Institute of Health and Welfare which gives a great overview of the success of ACCHOs and delivers the evidence of just how big a contribution our members are making to improve health outcomes for Aboriginal people. The comprehensive report shows that Aboriginal Community Controlled services provide culturally appropriate primary health care to over 310,000 Aboriginal people each year, around half the Aboriginal and Torres Strait Islander population, and are credited with three quarters of the health gains made against the Close the Gap targets. It shows our members perform over two million episodes of care per annum which is a one hundred per cent increase since this report was last handed down four years ago. Not only are we providing more comprehensive primary services to more of our people and seeing evidence-based very real improvements in some key health areas such as mortality rates, birth weights and chronic disease. Through our membership and Affliates we are also seeing more of our people employed in sustainable and meaningful positions across the Aboriginal Community Controlled Health Organisations sector. Reports like this clearly establish the economic viability of investing in our sector and simply cannot be ignored by decision makers. Coupled with the ten-point plan, the report has enabled NACCHO to increase the intensity of our national political lobbying efforts and demonstrate our value to some of the most senior members of the Federal parliament. This was a critical part of our strategy in the lead up to the Federal election – to raise the profile of our sector, illustrate its effectiveness and reinforce our multi-partisan approach to delivering good health outcomes for our people. The release of the ten-point plan also helped us raise the profile of Aboriginal health in the broader, mainstream community, attracting significant national media attention. The ten-point plan compliments the long-awaited National Aboriginal and Torres Strait Islander Health Plan (NATSIHP) released by the Gillard Government in July this year. NACCHO is proud of our influence on the content of the NATSIHP. We advocated for a health system free of racism with culture at its heart and we are pleased to see these points became an integral pillar of the final plan. We welcome the broad national recognition of Aboriginal Community Controlled Health services as a key to success as well as an acknowledgement of the need for capacity building in our communities. Going into 2014 our job now is to work with the new Abbott Government to advocate for a robust implementation and delivery process of the NATSIHP toward genuine change and advances in the priority areas our sector fought hard to be included in the plan and not lost in its interpretation during this next phase. Another key policy initiative highlight this year was Ochre Day and the launch of NACCHO’s ten-point Male Health Blueprint which offers tangible, practical solutions to the appalling state of Aboriginal male health. Ochre Day was a spectacular celebratory gathering of Aboriginal men from across Australia followed by a public event in Federation Mall. NACCHO’s Male Health Blueprint again attracted national media coverage and raised this important issue to the national agenda. Complementing these significant policy initiatives, NACCHO has spent the year strengthening some key partnerships. In May we signed a landmark with Medical Deans Australia and New Zealand aimed at increasing medical student placements in Aboriginal & Torres Strait Islander primary health care settings. This agreement will also support NACCHO’s potential to build the capacity to recruit more Aboriginal and Torres Strait Islander medical officers. As part of building stronger partnerships with other Aboriginal National Bodies we welcomed the invitation for the NACCHO Chairperson onto the Lowitja Institute Board, Australia’s only national health research organisation with a sole focus on the health and wellbeing of Australia’s First Peoples. NACCHO continues to work closely with our partners on the Close the Gap steering committee and as Co-Chair of the National Health Leadership Forum of the National Congress, I want to ensure a coordinated and collective voice is given to Aboriginal health in the national arena. Aboriginal Community Controlled Health services must be given due weight and provide leadership in those forums. In an effort to further spread good health messages to our communities and exemplify the excellent work that is being delivered by our member organisations to the broader community , NACCHO has also been pursing a new partnership with the AFL this year. Through this partnership we hope to leverage the respect and goodwill towards the AFL in both Aboriginal and Non – Aboriginal communities, encouraging more Aboriginal men and women to consider their health and seek out their local Aboriginal Community Controlled Health Organisation, while educating the non-Aboriginal community about the tremendous value our sector brings to the National Health system. NACCHO has also been active internationally in 2013, attending the United Nations Permanent Forum on Indigenous Issues in New York City where the human rights of Indigenous people in Australia and across the world were put under the spotlight as part of the Indigenous Peoples Organisation Network. Closer to home NACCHO has continued its commitment to listen to and communicate with our affiliates and members. In addition to delivering regular updates and news across the sector through the NACCHO communiqué, emails and social media outlets, attending numerous member meetings, conferences and forums, as well as hosting an election planning workshop, we held the first ever NACCHO Aboriginal Primary Health Care Summit in Adelaide in August 2013. The Summit was a direct result of the call from members at the 2012 AGM to provide a forum for our sector where we could highlight and share our achievements, celebrate our wins, address our challenges, network and learn from each other. The Summit attracted more than 350 delegates and more than 100 speakers, covering the core themes: Governance, Comprehensive Primary Health Care and Workforce. It was an inspirational three days, providing an array of insights, new directions, innovation and lessons , with strong positive feedback from delegates that they would like the “NACCHO Summit” to be a regular inclusion in the annual event calendar. 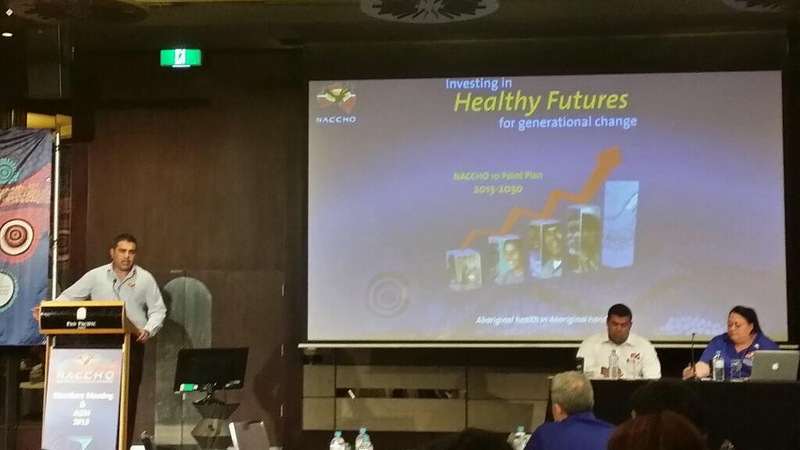 The future Aboriginal Health through Aboriginal Community Controlled Health Organisations. We have achieved much in the last twelve months. Looking to the next twelve months we face new challenges and opportunities as we continue to develop our relationships with a new Federal government and work collectively in bringing genuine gains in Aboriginal Health through Aboriginal Community Controlled Health Organisations. I am confident our collective work to date has positioned us well for what lies ahead and I look forward to working with our partners, affiliates and members over the next twelve months as we continue to improve the heath and wellbeing of our people.